When patients have only two blastocysts, they're often not sure what to do. Should they transfer both of them as fresh blastocysts? Should they freeze both of them and then do frozen transfers, one at a time? Or should they transfer one and freeze one? To help you make the right decision, you need to remember that what you need to focus on is the cumulative pregnancy rate. This is not just the chance of getting pregnant in the first fresh cycle, but the overall chances over a period of time, after you have transferred all your blastocysts. Yes, it's true that the pregnancy rate after transferring two blastocysts at a time will be better than transferring just one. Thus, if we assume a 25% implantation rate per fresh blastocyst, then if you transfer two fresh blastocysts, the pregnancy rate will be about 50% in that cycle. On the other hand, if you freeze both and then transfer them, one at a time, the cumulative pregnancy rate jumps up to 60%. This is because the implantation rate for frozen blastocysts is 30% per blastocyst per cycle, because the endometrial receptivity is better in a frozen cycle. Similarly, if you transfer one fresh blastocyst and freeze one because you want to have your cake and eat it too, then the cumulative pregnancy rate is 55% - 25% plus 30%. The actual implantation rate per blastocyst will vary, depending on the quality of the blastocyst; the receptivity of the endometrium ; and whether the transfer is easy. However, this model will give you a framework so that you can make a well-informed decision. 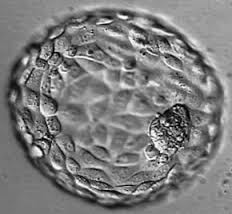 Our advice for our patients is to freeze all their blastocysts, and then transfer one blastocyst at a time. We tell them - you can have as many babies as you like, but one at a time ! This is safest for your baby, because singleton pregnancies have a better outcome as compared to twins. Yes, this option is more expensive, especially if you don't live in Mumbai, because you need to add the expense of your travel as well, but this is the best option from a purely medical perspective, as regards maximizing your success rates.